No kitchen can do without ventilation, mainly because it relates to the health of the people in the home and keeping the air fresh and safe to breathe in. While cooking aromas can be exciting, the moisture, grease, heat and smells can settle in, resulting in slate air, mould, toxins and dust, which in turn can create health problems. Without ventilation, the building’s fabric also could be damaged, weakening it. Better building construction techniques means air tight buildings that make for better energy efficiency. However, this has an undesirable side effect in the form of stale air retention. If someone at home is already suffering from respiratory problems like Asthma, it could get worse with poor ventilation. Kitchen ventilation can be the ductless wall mount type or with ductwork. In range hood fans with ductwork, the area under the hood contains the stale air that is then expelled outdoors through ducts by a fan. The more powerful the unit, the fresher the air. The filters in the system trap grease and other particles so that they do not get into the ductwork. These filters can be cleaned or replaced depending on the type. Some kitchens have re-circulating range hoods mounted to the wall over the cook top. There is no ductwork here. Instead, the air is pulled via a filter and re-circulated back into the room. This is not efficient as this air can contain gases and odors. Filters can be cleaned or replaced periodically. Yet another kitchen ventilation style is the downdraft system that is part of the range, on the stovetop close to the burners. This works for the island or peninsula type cook tops where it is difficult to install hoods. While cooking, the ventilation system rises to almost a foot above the cooking surface. The fans pull air via a filter into the ductwork that may be installed under the floor or over the cabinets. Stove location is important here, as it will determine the rate at which the ventilation takes place. There are plenty of hoods in the market that can be concealed under over-stove cabinets. When you need to use them, they can slide out. There are complex systems that combine a wall-mounted microwave over the cooking range. Here the ventilation hoods have venting fans under them and can double up as microwave shelves. 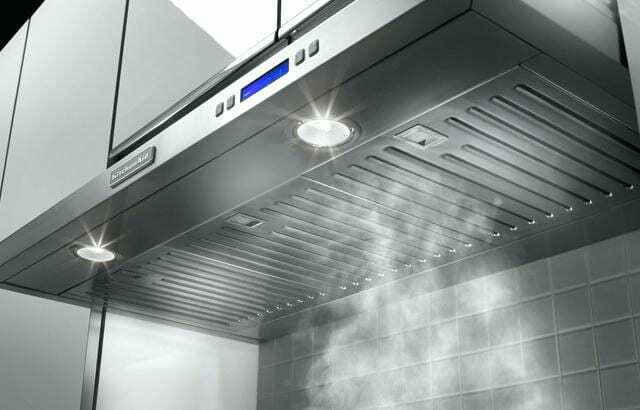 The job of the vent is to absorb air and steam; therefore, you must ensure that the hood or canopy is of the same size as the cooking range top. 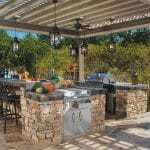 To keep up with your kitchen décor theme, there are decorative and customizable hoods and canopies available in stainless steel, panelling or tile to match your other kitchen elements. To keep your kitchen free from the grease and moisture from cooking, the visible surfaces need to be regularly washed to keep clean. Most ventilation systems come with manufacturers’ instructions and some come with an annual maintenance schedule. If you use your stovetop quite a lot, the steam that rises from your cooking settles on the windows and walls. There is also the risk of poisonous gas build up from your cooking range gas combustion. Thus, a range hood or vent is an absolute must so that stale smelly and moist air is driven out through the ducts, thereby keeping you and your family safe and healthy. Some Quick Facts About the Kitchen OvenWhat’s Cooking with Kitchen Ranges?